Hundreds of family, friends, entertainers, sports figures and even some former "Soul Train" dancers gathered to honor Cornelius' legacy and recall their recollections of the baritone-voiced host and entrepreneur. The nearly three-hour memorial service featured plenty of laughter and music, including a rousing performance of "Love's In Need of Love" by Stevie Wonder. The Rev. Jesse Jackson delivered a eulogy that centered on how Cornelius' creation created a platform for black music and culture that hadn't been seen on television when "Soul Train" debuted in 1970. "Don, we say thanks for being conductor of the `Soul Train' and laying the tracks," Jackson said. "We thank you because we needed you so badly and you helped us so much." Several speakers noted that Cornelius didn't just give a platform to performers such as Wonder, Aretha Franklin and the Jackson 5, but he also gave opportunities to black cameramen and demonstrated that television programming aimed at black audiences was viable. At several points during the service, photos of Cornelius on the show's set were displayed for the gathering, which ended with clips of the popular host dancing and delivering his signature sign-off, "Love, Peace and Soul!!!" 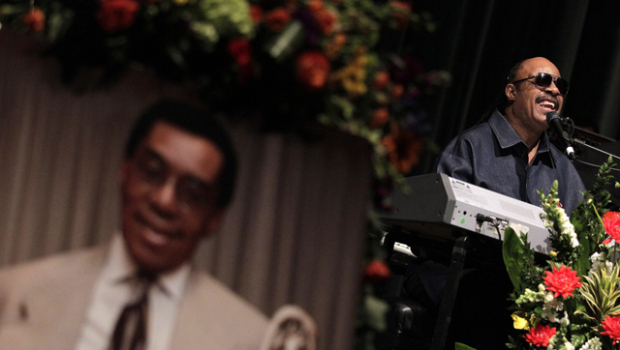 Smokey Robinson joked that Cornelius would often ask guests questions that veered away from their music, such as what they were driving and when they'd last eaten at a particular restaurant. "I'm really happy to be here because Don was my brother and I am celebrating his life," a smiling Robinson said. "I don't what the rest of you are doing." Remaining upbeat, Robinson told the crowd, "He started a platform for black people that before that time had not been seen. It had been heard, but it had not been seen." "Soul Train" was broadcast nationally from 1971 to 2006 and became one of television's longest running syndicated shows. He gave up hosting duties in 1993. Pastor Donnie McClurkin, who led the service, noted that his mother didn't allow her children to listen to popular music. But when she went grocery shopping on Saturdays, he and his siblings caught up on all the latest dance moves and music by watching "Soul Train." Cornelius was born in September 1936 in Chicago, served as a Marine in Korea and worked various jobs before getting into broadcasting in the mid-1960s. He was inducted into the Broadcasting and Cable Hall of Fame in 1995 and has a star on the Hollywood Walk of Fame, but his greatest legacy was the impact of his show, which not only brought black culture, but also black advertisers to nationwide audiences. His show came long before there were any networks devoted to television programming for black audiences, or black actors in prominent roles on network shows — key cultural barriers that Cornelius helped break down. Cornelius' granddaughter Christina said that to the world, her grandfather was a visionary and trailblazer. "He was all those things. But to me he was just grandpa," she said, breaking down. "My smooth voiced, loving grandpa." Several speakers, including Cornelius' son Tony, spoke of continuing Cornelius' legacy. Earvin "Magic" Johnson recalled meeting Cornelius in the early 1980s after he started playing with the Los Angeles Lakers. "Shoot, I come around the corner and I see that big `fro, I already knew who it was," Johnson said as the crowd laughed, "but I was scared because I always wanted to meet him." On Thursday, Johnson said he was committed to helping keep the "Soul Train" going. "Tony, it's our job to keep the legacy going," Johnson said. "The brand that your father has created will last a lifetime." Several speakers also offered condolences to the family of Whitney Houston, who appeared on Cornelius' show and died unexpectedly Saturday at age 48. Wonder mused that Cornelius would be pleased to have Houston join him and other musicians in heaven. "I can only hope we continue to keep this man's life and legacy alive," Wonder said. Cornelius, 75, died Feb. 1 from a self-inflicted gunshot wound, and Jackson urged people not to judge him. "We reveal our successes to the world but we conceal our pain," he said. Rather, Jackson said, the public and those who knew Cornelius well should remember what Cornelius built with "Soul Train" and what it meant to the world. "It brought joy. It brought pride. It brought talent. It brought hope. It brought opportunity. It blazed trails. It reconciled racism," he said. "Tell them what you know, not what you imagine." Hey! I just would like to give an enormous thumbs up for the nice data you may have here on this post. for the nice data you may have here on this post. good info you might have right here on this post. great information you’ve right here on this post. you have got right here on this post. I will likely be coming again to your blog for extra soon. way to be out your financial obligation versus your income.